Modern website design is an indication of the visual experience to come. Potentially lucrative Red Stag VIP Loyalty Club with achievable statuses. Residents of many countries not eligible for bonuses. 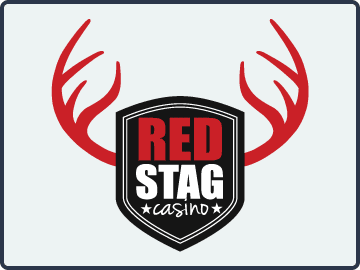 When we compiled this Red Stag Casino review, the first thing we noticed is that the website´s graphics are far more advanced and far more appealing than many others. The reason for this we later found out is that Red Stag Casino is one of the latest additions to the Deckmedia stable of online casinos and uses the latest technology to create a fresher and welcoming gaming environment. But what did we find on greater inspection? Was the appealing website representative of the games on offer? Was the welcoming environment mirrored by our online casino experience? Was the headline Red Stag Casino bonus worth pursuing? The answers to all these questions and more will be revealed in our Red Stag Casino review. But first, a little about the background to the casino. As mentioned above, Red Stag online casino is the latest addition to the Deckmedia stable of online casinos. The Deckmedia Group has been around for more than a decade and has developed a reputation for integrity and timely cashouts. Although a company´s past performance is no guarantee of its future performance, we found nothing in our review that would dent the company´s good reputation. Predominantly a US-friendly online casino, the site accepts players from all jurisdictions “where online gaming is not prohibited”. However, although accepting players from almost everywhere, those located in Canada, Greece, Poland, Brazil, Romania, Bulgaria, Moldova, Israel, Russia and Ukraine will not be eligible for bonuses, while residents of the UK have double playthrough requirements. The first thing we always do when compiling our online casino reviews is check out the gaming software. After all, if the gaming software is not very good, you are not going to have a great time playing at the site. The software driving the games at Red Stag Casino is provided by WGS Technology software – which is good news if you play slots, and not so good news if your preference is for table games. The choice of good quality slots is impressive. You can play on three-, five- and seven-reel games with bonus rounds and progressive jackpots. There are also hi-res slot-style games in the specialty games lobby. Many of the table games look out of date for the 21st Century and, as you will see below in the bonus section, this site does not really cater for table games players. We recommend you download the full version of the Red Stag Casino software. Although options exist to play in Instant Play mode and via a mobile, the choice of games is not so great and the graphics not so eye-catching. As many of the bonus free spins are for the most graphically pleasing games, you will enjoy a better gaming experience at Red Stag Casino on the full download client. Each bonus amount is added to your bonus account immediately. In order to get the free spins, you have to contact customer support by email, phone or chat every time you make a deposit. The same applies to any daily or VIP Club bonus with free spins attached. The specific slot games shown above are current at the time this Red Stag Casino review is written and subject to change. In most online casinos, you are given the opportunity to forgo the headline bonus and choose a lesser bonus if you want to play casino games other than slots. Not here. Although options exist for a 25% cashback bonus and a Bitcoin bonus (300% up to $600 on each of your first three Bitcoin deposits), bonuses for table game and video poker players are non-existent. Furthermore, the “wagering contribution” of Blackjack and video poker is just 10% – baccarat, craps and roulette do not count towards clearing the Red Stag Casino bonus at all. However, you do earn Comp Points for your action in non-slot activities (not all online casinos do this), which can then be exchanged for cash through the Red Stag VIP Club. Once you have made your first real money deposit of $25.00 or more, you are automatically enrolled in the Red Stag VIP Club. The “Club” is a six-tier loyalty program that rewards you for your action at the casino with additional reload bonuses and cashback. You status within the VIP Club is determined by the number of lifetime Comp Points you have earned and subject to a minimum requirement each month. Comp Points are awarded at the rate of 100 per $100 wagered on slots, 65 per $100 wagered on video poker, and 50 per $100 wagered on table games excluding Blackjack (35 Points per $100 wagered). The rates at which Comp Points are awarded as you climb the VIP statuses – enabling you to claim more valuable reload bonuses and exchange you Comp Points for more cash. The maximum bonus applied to Skrill/Neteller deposits is 49%. A better bonus percentage is available if you deposit by Bitcoin. The minimum withdrawal that can be requested is $150. Withdrawals are limited to a maximum of $2,000 per week. Red Stag is one of the leading online casinos when it comes to withdrawal option. Free withdrawals are available via Skrill/Neteller and Bitcoin and although there are fees attached to withdrawals by check ($30) or wire transfer ($60), these are modest in comparison with some other sites. Withdrawal requests can take up to 72 hours to process, with the exception of Bitcoin withdrawals that are processed within 48 hours. Customer support is very good. It appears that the Customer Support Team has remained intact for a number of years (or been drafted in from other Deckmedia casinos) and the team members seem to know their stuff. They are ready to help you 24/7 in the unlikely event you have a problem, and can be contacted by live chat, email or phone. Red Stag Casino also gets top marks for player security. Although a relative newcomer in the world of online casinos, we have not seen any complaints about the fairness of the games or late payment issues. The casino provides the facility for players to review their playing and transaction history at any time. It all seems transparent to us, and we couldn´t find any faults in this area. Was the appealing website representative of the games on offer? Yes – for slots. Was the welcoming environment mirrored by our online casino experience? Pretty much. Was the headline Red Stag Casino bonus worth pursuing? As long as you read the rules first. Good quality software for playing the latest slots games. Attractive and easy-to-navigate website with plenty of information. Stacks of clearable bonuses and cashback offers for low-stakes slots players. Table game bonuses are effectively non-existent. The $10 maximum bet limit could catch a lot of people out. Low wagering contributions for Blackjack and video poker games. There are always compromises to be made when selecting the best online casino to play at; and although we found plenty of areas we were not entirely happy with – limits on Skrill/Neteller bonuses, lack of table games bonuses, low wagering contribution for table games, etc. – would we be happier with (say) 100% Skrill bonuses and a lower level of Customer Support and player security? Probably not. We feel Red Stag Casino is an ideal venue for a low to medium stakes player who is seeking an enjoyable online casino experience with the surety he or she will get paid if they win. There are plenty of high quality games, bonuses to aim for, and a potentially rewarding VIP Club with achievable statuses. You could ask for more, but what would you give up in order to get it? We like Red Stag Casino and believe most (reasonable) people will like it too. Recommended. Visit Red Stag Casino Now!